Game & Movie Releases for the week of October 21st to October 27th, 2018. This week is also the first release of Maximum Overdrive on blu-ray and the first non-collector's edition of the 1990 Night of the Living Dead. A sad, sad week for your wallet. A happy week for your console or Blu-ray player. I feel sorry for every other game released this week...cuz few people will care. Mine is still in the mail..... downside of living overseas. can't wait to get my copy. I hope my girlfriend understands when I tell her that this game takes precedence over her for the next month (at least). I've never played Red Dead Redemption. 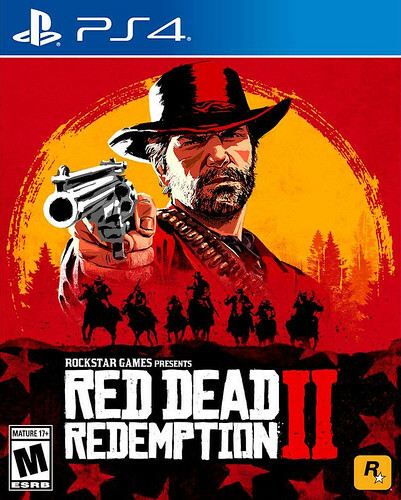 I always assumed it's just Grand Theft Auto in the wild west. Is that right? Nope. That's not right. Because GTA is mostly about driving around in any one of a thousand different cars and while you can steal horses in Red Dead, it isn't the main focus of the game. It's more of a story-based western. You do as much fighting on foot as you do on horseback. I wouldn't say it's a better game than GTAV, because the story and production values were through the roof on that one, but it's certainly more fun overall because of the theme. I keep wanting to turn on my PS4 just to see how much time is left until it unlocks. Red Dead and Mr. Bean in the same week? Heavens to Murgatroyd! And yet, it's not wrong! Red Dead 2 is preloaded on my XB1X. But I still need to finish AssCreed Odyssey, Soul Caliber 6, Forza Horizon 4, BLOPS 4, and who knows what else. Hope I remember how to play them in a month or so. Forgot another notable release on PS4 this week: Castlevania Requiem: Symphony of the Night & Rondo of Blood! Looks like I'm finally picking up a PS4. Tried to find the Spiderman one, but man those things are sold out! Can find them online with an inflated price... But I don't wanna she'll that out for the console. They are attractive to the eye though. Looking forward to playing cowboy again. I was nerdy before it was cool to be nerdy. Yeah, the Spider-Man PS4 was essentially sold out before it even launched. I lucked out and grabbed one of the two my local Best Buy had in stock when the store opened that Friday. If I had been a little proactive and preordered, I would have been able to get one fairly easily...but by the time the game/console was actually being released, it was effectively sold out. I have to go to SF tomorrow and wont be back until Sat evening. At least it will be all preloaded and ready to go. Went in and pit the money down today. I have to tear down some clustered services, install them on a modern OS, and rebuild the cluster tomorrow. Wish me luck that I get to pick this up tomorrow night. I have Friday off. Hooray for Single player games!